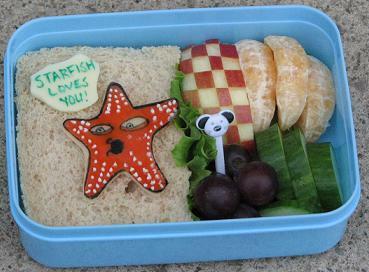 Bento for Kidlet: Starfish Loves You!!!! Kidlet has a starfish made from cheese and food coloring on top of peanut butter and honey. On the side are checkered apple, clemetines, grapes, and cucumber. Starfish looks extremely cool! Always good to have a starfish love you!! Wow the Starfish loves ME! The videos seem to be fun! Wow, that is so awesome! :D Love the starfish! Aww yay for Zhu Zhu pets! Kidlet was sick today and had his sitting with him all day :) they are so cute! Lets go to Candy Mountain, Charlie! so youtube is the new cartoon network? i'll bet the quality of shows is way better too. meanwhile, that checkered apple is all kinds of awesome!